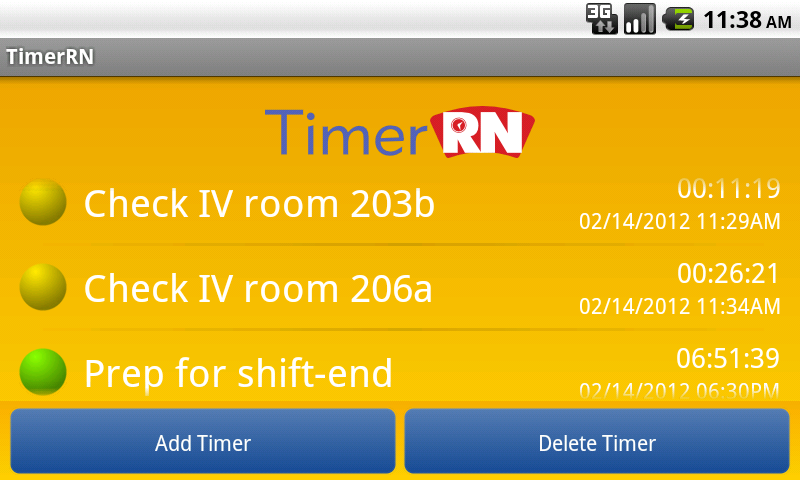 Yesterday, we published our 12th Android app: TimerRN. This app has been a long time coming, primarily due to my getting distracted by other projects. Hokan worked on the first version; Matt did some major re-work after I tested it and figured out what worked and didn’t in the original design. The original idea for this product actually came from a conversation I had with Mark Burke of Voalte in July, 2010. Voalte describes itself as providing “compelling software solutions for healthcare institutions that solve communication problems at the point-of-care.” They concentrate on iPhone- and iPad-based solutions but Mark was kind enough to spend a bunch of time on the phone with me, talking about Android apps for nurses, and, among other nuggets, threw out a suggestion that we implement a ‘drip timer’ app. TimerRN is a bit more general than that first idea. 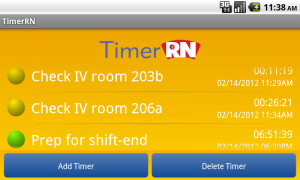 Nurses can set multiple timers and alarms for IV drips, medicines that have to be dispensed outside the standard schedule, getting patients ready for transport, or even to when to take their next break. It’s been a busy month but Matt helped me make the effort to get TimerRN published. We’ve made it as good as we can internally; it needs users working with it to get better. And it’s great fun to have an even dozen Android apps in the Android Marketplace.